New users are always welcome! Thought some of us might relate to this quote from Ned Rorem, whose writing is full of such things : a well-worn cliché ? I think so, still I could relate in part. "The shock in growing up - that everyone wasn't like me! I'd assumed the world was made of Hawthorne readers, Ravel listeners, Duchamp lookers, or of little boys who cut gym class to write music." That first sentence is universal in any case, even among those who have never ever heard of Ravel. The greater shock is in discovering that everyone is like you in thinking like that! It's one of life's paradoxes: people are alike all over; and everyone is an individual. People are all the same, just in different ways. Indeed. There is probably no one thing in which I am completely unique. Therefore, humans were created singly, to teach you that whoever destroys a single soul [of Israel], Scripture accounts it as if he had destroyed a full world; and whoever saves one soul of Israel, Scripture accounts it as if he had saved a full world. And for the sake of peace among people, that one should not say to his fellow, "My father greater than yours;" and that heretics should not say, "There are many powers in Heaven." Again, to declare the greatness of the Holy One, blessed be God, for one stamps out many coins with one die, and they are all alike, but the King, the King of kings, the Holy One, blessed be God, stamped each person with the seal of Adam, and not one of them is like his fellow. Therefore each and every one is obliged to say, "For my sake the world was created." What if snypsss suddenly developed an enthusiasm for Havergal Brian? The composer, and not any one performer (how brilliant soever) owns the piece. Music without passions and feelings is meaningless. If music of absolute calm be music without passions (and I think it might), then I don't believe it is meaningless. The calm is itself the meaning. Music without feelings . . . well, I almost want to ask, Is music without feelings possible? Again, I think it reverts to the idea that music excites or resonates with feelings, but the precise nature of those feelings is a question. A family of Mizrachi origin (that is, originally from Arabic or Persian speaking countries, the Sassoon family of England being the best known example) has recently joined my synagogue. The family name is Bassoon. Back in 1960 three friends, all students at UCLA, invented minimalism: La Monte Young, Terry Jennings and Dennis Johnson (Terry Riley would soon join them but he was not at UCLA). 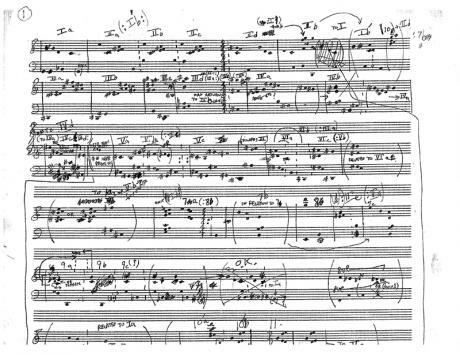 Of these, Dennis Johnson is credited with writing the very first piece of music that later came to be called Minimalist: his four (to six) hour work for piano called November. Didn't Prince Charles (when he was a kid) think that everyone lived in a castle? Just read a report stating that Ivan Fischer and his crew have recorded Tchaikovsky's 6th, and were both lively and under control doing it. The reviewer gives the impression that there is more to the symphony than its finale. Who knew? Salud e dinero... Hah! So that's what is missing.